Home | Tai History | Tai Village History | 2018 Festival | Volunteers | Members and Donations | Reservations | Community Page | Community Albums | Contact Us. Vendors please contact Phimmachan Baccam at (515)274-6123 for more info. Please come and experience Tai and other Asian Culture, enjoy great family time, taste varieties of food, listen to live music, dance and meet the neighborhoods. Many more events and activities are being added to this year's festival. This event is opened to the public, free admission and $5 donation for on-site parking. Thank you so much to all our wonderful volunteers and if you were able to be at this year's festival, thank you for your support. If you have any suggestions or comments about this year's festival, please let us know, your feedback is very important to us. Note: Post-Festival/pot-luck meeting this Sunday, September 14, 2014 at 3pm. Click to see 2013 Festival poster. Miss Tai Village 2013 Application. Early Bird Registration Special- $50 off, deadline June 30, 2013. 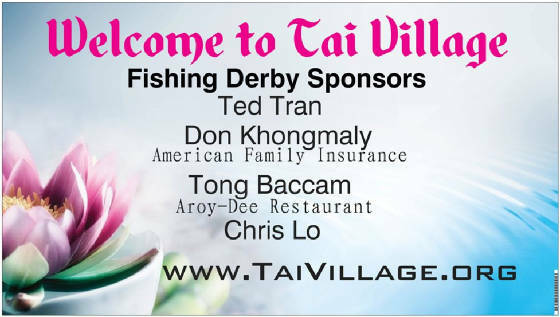 Fishing Derby sponsored by: Ted Tran, American Family Insurance(Don Khongmaly), Aroy-Dee Restaurant(Tong Baccam) and Chris Lo. $20 fee per angler, which includes Tai Village 2012 fishing T-shirt. Fishing on Saturday from 9am to 3pm, 2-$500 fishs, plus bonus $50 fish and plenty of $20 fishs, Please bring your favorite fishing gear. 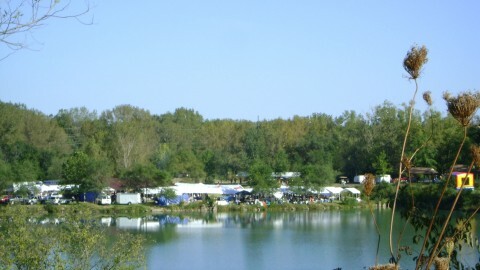 May the best angler win and have the bragging rights for 2012. 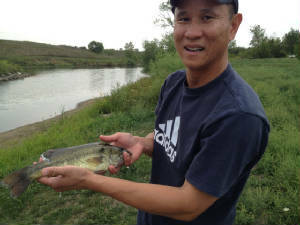 Note: Special thanks to Ted and Dr. Therese Tran for overseeing the fishing derby event. Tagged bass is worth $500. 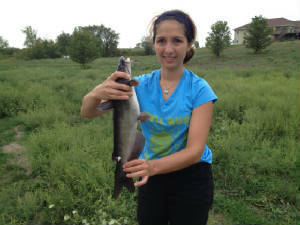 Tagged catfish is worth $500. Thank you for your continued support and contributions. Tai Village Inc is a 501 (C) (3) organization. Your contribution is tax deductible.